As the parent of a sensory kid, my child chews almost everything. From his clothing to the computer headphone wires, nothing is off limits. Why not make our own DIY Chewelry Necklaces to save money for your own child with Sensory Processing Disorder or Autism! What is a Chewy Necklace? Don’t know what chewelry (or a chewy) is? Chewelry is usually a plastic necklace that children can chew on. Many children with Sensory Processing Disorder and Autism have an innate need to have something in their mouths — they’re oral seekers. Chewelry, or chewies, give them a positive outlet to get that sensory need fulfilled. Chewelry can get really expensive if your kid actually chews through them (which mine does). One mom recommended we try making our own chewelry for kids who absolutely need something in their mouth, and she was kind enough to allow me to share it with you. A while back, we were talking in my online Facebook group for The Sensory Spectrum about chewelry. 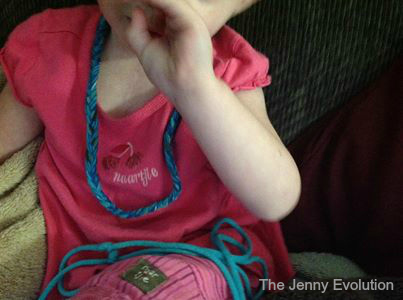 To combat her child ruining her clothing, fellow sensory mom Sheri K. takes her kiddo’s old t-shirts, cuts them into strips and then braids them into a kind of necklace. Her daughter can wear the braided chewelry necklace and chew ’til her heart’s content without killing her clothing. Brilliant, right? And Sheri was so generous, she’s allowing me to share the picture of her kiddo with the homemade chewelry. Don’t get me wrong… we still love our original chewelry. My son’s favorite is the Sensachew Dog Tags (affiliate). Even though my kid sometimes needs something more substantial, these homemade chewelry necklaces are terrific! 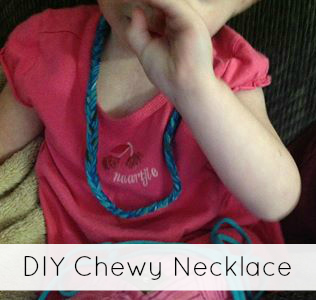 Of course, use common sense if you make one of these DIY Chewelry Necklaces. Please make sure your child is old enough to manage wearing it (it could be a choking hazard). Also, be sure to wash these necklaces on a regular basis. Can you imagine if you didn’t. Ew! This is a brilliant idea! I made a toy out of old shirts for our dogs but it never occurred to me to make one for my daughter who loves to chew! lol! 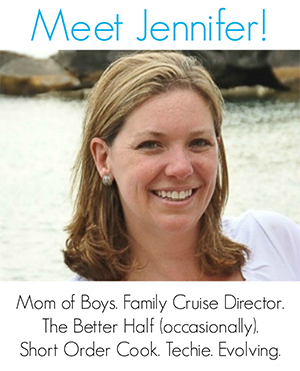 Hi Jennifer. Thanks for teaching me something new today. How is this necklace fastened? I dont see a tutorial and Im having a hard time imagining how this is actually made…thanks! We just tie it in the back… this is why it’s really meant for older children because it can be a choking hazard.